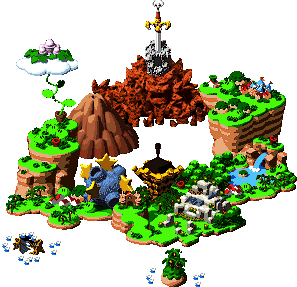 Nimbus Land is a floating kingdom on a massive cloud where Nimbus live in Super Mario RPG: Legend of the Seven Stars. It is ruled by King Nimbus and Queen Nimbus, who have a son, Prince Mallow. Nimbus Land also refers to World 6, which includes both Nimbus Land and Barrel Volcano. The giant cloud of Nimbus Land is attached to a vine accessible from Bean Valley, the only known way to access it from the ground. The palace of King Nimbus stands in the center of the town. Normally, it houses many statues and birds, both of which the king is fond, and the citizens of Nimbus Land are free to enter. During Valentina's attempted usurpation, however, the palace is sealed to the public and its halls are filled with monsters. Other noteworthy locations include the usual item shop and inn, Garro's studio, the docking point for the Royal Bus, and the royal hot springs. The Nimbus innkeeper gives the option of using his special "Dream Cushion", which costs an extra 30 coins and causes Mario to have dreams. The hot springs instantly restore HP and FP and are situated directly over Barrel Volcano, but only royalty can bathe there. For a long time, Prince Mallow was missing. Valentina, however, pretended she found the prince during a plot to become queen of Nimbus Land. 'Prince Mallow' was actually Dodo, a large bird, but the population of Nimbus Land was convinced for a while that he was the true prince. However, the real Mallow was traveling with him. They, along with the other members of their party, stop Valentina and Dodo and rescue the king and queen. Later, Croco comes to Nimbus Land in his ongoing search for treasure. If Mario finds him, he drops the Signal Ring. Also, Shy Away can be found hiding in an unlikely spot, on a hidden path. He bribes Mario with Fertilizer in exchange for letting him go free. Nimbus Land's name refers to the Latin word for cloud, nimbus. ↑ Super Mario RPG: Legend of the Seven Stars Nintendo Player's Guide, pg. 4. This page was last edited on December 21, 2017, at 17:07.